It’s been a while since I’ve had a reason to post and a lot has occurred since my last post including the departure, reemergence and second departure of the founder and CEO Phillip Rosedale. An unexpected price increase or more precisely the ending of non-profit discounts saw many educators scurrying for alternative virtual worlds. But with all this upheaval Linden Lab continues rolling out new and exciting features that are now in beta including Mesh imports and most recently the ability to access SL via a browser. Browser access is made possible by streaming SL via Gakai’s cloud-rendering. Gaikai requires no special hardware or extra computing power. Rather, it can run premium 3D games on something as lightweight as a netbook or smartphone. These are indeed exciting times for anyone interested in the benefits of virtual worlds. A video showing the almost infinite possibilities for data visualization within Second Life by Alchemy Sims. As you know I’m always on the lookout for new ways to create engaging material for my accounting students. Well ZooBurst is a digital storytelling tool that is designed to let anyone easily create their own customized 3D pop-up books. It is also an augmented reality program allowing you or anyone else to view the book you’ve created in the palm of your hands. As you’ll see in the video below, you need pretty steady hands so this will work best for the surgeons among us. The interface is simple enough to use so creating a story is as straight-forward as 1) having a story to tell; 2) finding the correct clip art, 3) moving, sizing, rotating the clip art on a page; 4) adding the text to he clip art callouts and to the page. After that you have a 3-D pop up book, viewable via the web, embedded in a web page (see below) or as mentioned earlier in the palm of your hands. So, here is my story below, please let me know what you think of this tool as a way of engaging students with accounting content, what suggestions you have for improvement and if you try, please share the stories you’ve come up with. Today marks the first day of the SL Pro Conference . It started with a key note by Tom Hale and I’ve recapped some of his major points below. 2009 User-user transactions grew by 65%. Xstreet Sales grew 74% 2008-2009. User hours grew 21% to 481 million per year. Announced Linden Endowment for the Arts, designed to support, encourage and highlight Second Life artists. Recipients of an arts endowment will include a land grant; the creation of a dedicated Second Life arts committee; and the capability for Linden Lab to store art creations for future generations. But so much of the content has been in a walled-gardent, because of “thick” downloads and viewers. “We must make it easier to amplify your awesome“. In order to bring in new users, creators, business’s, organizers, etc., and because Linden Lab knows that new users become consumers the only way to do this (to increase the 5% user growth noted above) is to make the platform/ecosystem successful. In doing this Linden Lab looked to lessons learned from Facebook and iPhone -“experience matters”; the Quality of the Experience! 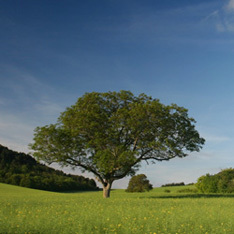 The eco-system (Second Life) creates the experience. For 2009 the focus has been on the user experience and how it is mediated via the viewer. The complexity of the viewer made it hard to adjust to Second Life, creating a feeling for new users of being overwhelmed. To address this issue Viewer 2.0 is being rolled out as a Beta today. Viewer 2.0 – is the most ambitious project by Linden Lab to date (hmmm I’m thinking the Second Life platform had to be pretty abmitious for them). Some of the Viewer 2.0 capabilities are: shared media (support for Flash – finally), better search, easier navigation, alpha masks, and most importantly it is easier to use! Search: Powered by Google Search Appliance, my understand is that search will be an html experience allowing for search to be desegregated from the client. Communication: Separate public from private chats. Made an effort to make voice more easily accessible. Messaging can now be managed (just like an in-box). Home Panel – 100% html, will be (or can be) account and location aware. Mesh is not part of 2.0 but is coming later this year. Shared Media (game changer??) – place any web URL onto a surface and allows you to interact with it just like a web browser, as you click a part of the web page the viewer will animate the camera to view the media – it breaks down the walled garden of Second Life including access to flash. Opens up Second Life to web-standard type tools and technologies. Supposedly this feature is drag and drop! For 2010 Roadmap Linde Labs will be looking at asynchronous and synchronous interactions and how that works. But more broadly thinking how to improve the overall experience for the full life cycle, not just the newbie experience. Social experience, creator and developer experience will be targeted. Introducing new capabilities Media, Mesh, investing in platform (more scalable, modular), virtual goods, etc. Intellectual Property – new tool for IP, called the viewer directory that lists 3rd party viewers that respect the rights of content developers. Viewer developers must comply with SL policies and SL terms of service. IP complaint process, IP takedown tool, Viewer Directory, Seller Register, and a new Commerce System. The openess of SL can not harm integrity of SL, SL will protect creators. SnowGlobe 2.0 was also announced. Tom’s biggest message seemed to be Linden Labs supporting “Amplifying the Awesome” by creating a platform that will help developers and through the new viewer allow new users to enter Second Life and not be overwhelmed with the “what do I do now” question. The attempt is to make the functioning of Second Life more intuitive – lets see how things shake out. As some might know I’ve been using Second Life in my financial accounting class at the University of Central Florida since the fall 2007 semester. Since that time my class size has gone from an average of 200+ to 800+. I have tweaked the learning objects each semester to try to improve the students learning experience, from the way the students interact with the 3-D accounting equation and interactive T-account to how they submit their homework, now employing automated homework boxes that examine the formatting of the data and the naming convention of the notecards that the students use. The homework on the notecards is now automatically read and sent to a MySql database and a confirmation e-mail is sent (well usually this works) to students so that they know they’ve submitted things properly. As the occasional reader of this blog will know, well firstly I only occasionally post, but secondly I’m interested in using Second Life to engage my students in what surprisingly I’ve been told is a rather un-engaging topic. So I’m always listening to feedback from my students about my use of Second Life and the problems some of them have. In fact when asked how my students feel I usually reply that anecdotally the students fall into thirds: 1/3 really like it, 1/3 really hate it, and 1/3 just use it because it’s something that is required. But as I prepare for the start of the Spring 2010 semester I thought I should look at some actual data to see how students feel. I am always cognizant of the cost/benefit of using Second Life for my students and for ME (as it takes up most of my time, answering orientation questions, grading non-automated HW assignments, dealing with students whose laptops aren’t powerful enough, etc.). And I wanted to see if the “noise” from the 1/3 “I hate it group” is causing me to actually inflate the size of that group – the old squeaky wheel thing going on. You will notice that when class sizes are relatively smaller more students felt that the use of Second Life helped them to understand the accounting concepts, those students who agreed or strongly agreed overall represented 55.5% and 58.6% when using just the learning objects. The number’s here are comparatively low, but during this semester Second Life was voluntary and not a required component of the course. So (and BTW if you’re still reading this far down, thanks!) I would say that any tool in which 40% or more students agree helps them to understand accounting is well worth the effort. I’ve just finished playing with a new release of the Second Life™ Snow Globe viewer. 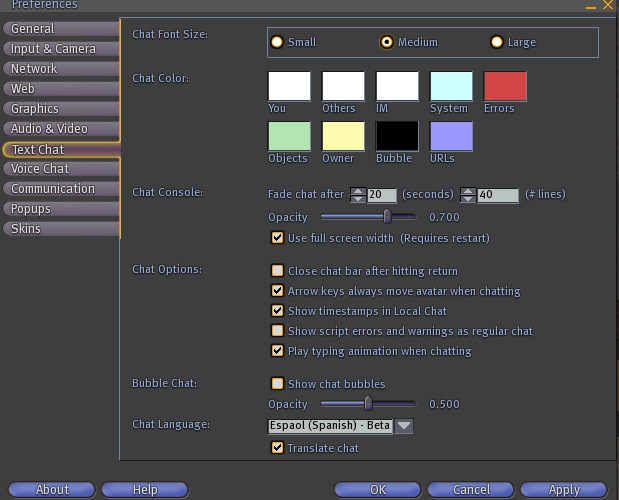 In this release, chat is translated automatically. The chat translation is not the default though, you need to select it from your Preferences, Text Chat and select the language the chat is translated to/from. Once you’ve done this, you can now chat with a group of avatars and they will see your chat translated into the language you’ve selected in your prefences (see Chat Language above) and their chat will also be translated. I teach accounting so you might wonder how this could affect me. Well not only does the chat translator work with avatar chat but it also works with object chat. That is, with the text an educational object is scripted to “say”. 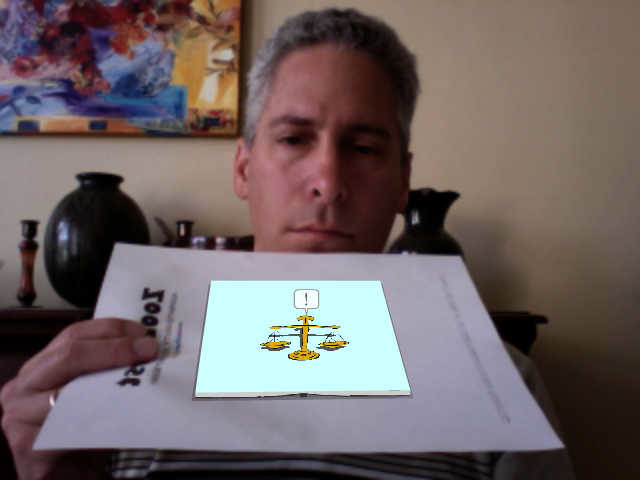 This could be objects used in an orientation for your students, or in learning objects. Now if a student is more comfortable in a language other then English, they can use the same objects you create and read the chat in their own language. For example see this image of my accounting equation providing feedback and notice that the text is shown in both English and Spanish. Now I don’t know Spanish so I can’t vouch for how good (or not good) they are, but I imagine they will only improve over time. Certainly if I was teaching a foreign language this would be a huge boon, but I can also see other possibilities, what if there were an accounting translation version? Accounting after all is the language of business, and many first time students struggle more with all the new terminology then with the actual number crunching. To try it out yourself you need to download the beta Snow Globe Viewer, the links are provided below (Note: I was using the Mac version and it worked just fine). On Sunday I’ll be doing a workshop as part of the American Accounting Association‘s annual conference. My workshop will be given prior to the officaial start of the AAA as part of the Conference on Teaching and Learning in Accounting (CTLA). I struggled to figure out how to do a workshop about Second Life in a limited amount of time, with attendees who have limited experience in Second Life if any, and who will have limited if any internet connections. I wanted to keep away from PowerPoint and find something that would be compelling enough to keep the groups attention, my argument is that Second Life is engaging so my workshop should be too. Thankfully I stumbled upon a wonderful new presentation tool called Prezi. I see Prezi as a tool that helps you to tell a story and while PowerPoint lends oneself to use a lot of text, Prezi lends oneself to use more media – flash movies and pictures along with text to help tell the story. You don’t have to worry about transitions, Prezi zooms into each object in your presentation which turns out to be a really nice way to show emphasis. Prezi is fairly new and there are certainly some things I’d like to see. For example, a way to include sound so that I could create a narrated presentation or at least some background music. It can be more flexible in terms of themes and color choices as well, but all in all I think it did a nice job of forcing me to think a bit outside of the box. Will see what the workshop thinks about it. Below is an embedded version of the prezi (you can also see a larger version that is hosted on their site). One thing that might not be inuitive at first is the need to click through the presentation and that is accomplished by using the controls on the bottom right corner of the prezi. You can view it full screen, click on any object to zoom in for a closer look, and click the links to open up a web page. One of the nice features is that when an object is a flash movie, it automatically starts playing nice and seamless. Let me know what you think in the comments. I’ll also be giving a talk about Twitter and how it can be leveraged for classroom use in which I’ll be doing a basic run down of what twitter is – for anyone in attendance living under their green eye shades. I’ll also cover some of the relatively newer ways of interfacing with Twitter including TweetDeck, Seesmic, Spreadtweet, Mishnet, and Tunein. For managing multiple accounts something most anyone using twitter will end up doing, one for personal use and one for the classroom, I’ll be talking about two products, HootSuite and CoTweet. And finally I’ll be discussion a neat tool from Poll Everywhere that allows you to take polls with responses coming from various sources – the web, text messages, mobile web and of course twitter. I haven’t tried this yet but will later and will update the post with my impressions, but as the video demonstrates at the link above, this tools could greatly enhance the ability to, of course, back up your work (I wonder what it does with the scripts contained in the objects you backup??? ), but also serve as a semmingly very easy tool for distributing content to users – either paying or in an opensource model. Will post more as I learn. is a toy for generating “word clouds” from text that you provide. The clouds give greater prominence to words that appear more frequently in the source text. You can tweak your clouds with different fonts, layouts, and color schemes. The images you create with Wordle are yours to use however you like. You can print them out, or save them to the Wordle gallery to share with your friends. I checked out the presentation by Tom Barrett, and then made my own Wordle of this blog, very nice way to visualize text and the whole process to tweet, to prezo view, to Worldle blog about 20 minutes. Cybertech News ran a post reporting on the company GreenPhosphour which is working on bringing 3D data into virtual worlds. They are currently using the tool for drug discovery and development. 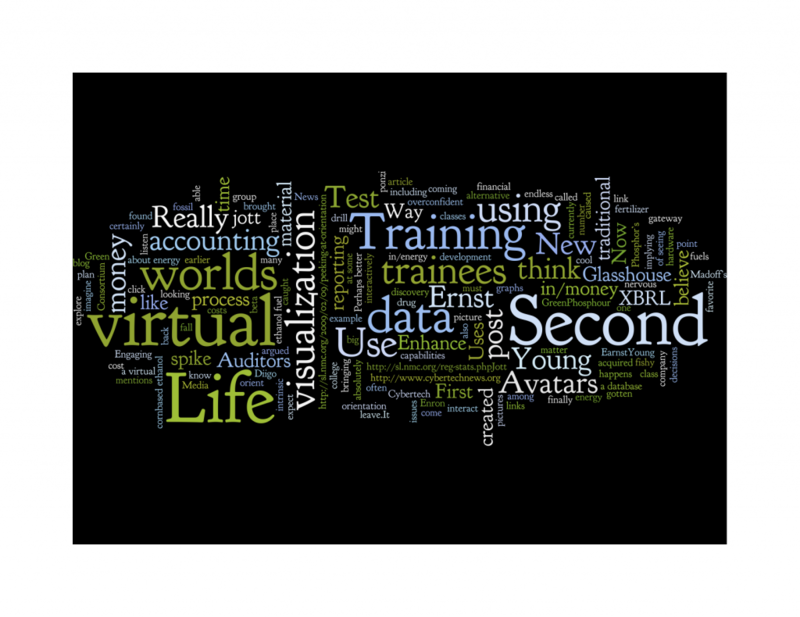 Now imagine being able to walk through, and interact with financial reporting data, via XBRL brought into virtual worlds like Second Life – the possibilities seem endless. Glasshouse is now in public beta, I plan on trying it out soon and will certainly report back with visuals of XBRL data when that happens. Really Engaging Accounting is where I write about how I incorporate new technologies into the instruction of financial accounting. Copyright © 2019 Dr. Steven Hornik. Titan Theme by The Theme Foundry.